Crossword puzzles have never been this adventurous! Explore beautiful landscapes with Bindi the Explorer and Eggsy the Dodo in their hot air balloon. With progressive difficulty even the best word puzzlers will end up scratching their heads. Word Explorer is available for Android and iOS. Our new word game brings to life a simple word puzzle challenge. Set on a farm you must complete all of the word puzzles and anagrams by guessing the hidden words using the letters available. Word Farm: Animal Kingdom strives to be the best word game for Android and iOS that all of the family can enjoy. Minigames have never been so much fun. Come and play with the Party Pals and have the happiest party in the World! Play party mini games to generate happiness, then relax on the beach and enjoy the sun, fun and party atmosphere. Super Happy Party is available for Android and iOS. 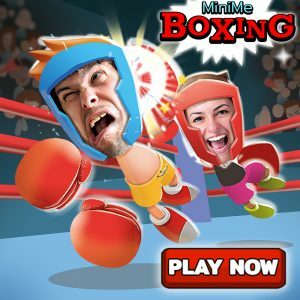 Mini Me Boxing puts you as the star of the game. Fight your friends and opponents from across the World on your journey to become the boxing champion of the World.